Megatrend Master Series: Claim Your Place For Equitymaster's First Ever Megatrend Master Series. It's Free! It’s our effort to introduce Meditation to busy Executives, COO& CEO’s of this Corporate World. Fist published study on Meditation, Relaxation Response – Developed by Dr. Herbert Benson, Associate Professor of Medicine of Harward Medical School, in his book “The Relaxation Response” - Relax your way to better health. Sit in a comfortable position, so there is no undue muscle strain, and choose a quite environment with few distractions. Avoid lying down; there is a tendency to fall asleep. Breathe through your nose. Become aware of your breathing. As you breath out say a word “one” to your self. For example breathe IN --- OUT, “one”, IN --- OUT, “one” etc. Breathe easily and naturally. The repetition of “ONE” helps break the train of distracting thoughts, attention to the normal rhythm of breathing enhances repetition. Continue for 10 to 20 minutes. You may open your eyes to check the time, but do not use an alarm. When you finish, sit quietly for several minutes, at first with your eyes closed and latter with your eyes opened. Do not stand up for a few minutes. Do not worry about, whether you are successful in achieving a deep level of relaxation. Maintain a passive “let it happen”, attitude and permit relaxation to occur, at its own pace. When, distracting thoughts occur, try to ignore them by not dwelling upon them and return to repeating “ONE”. With practice the response should come with little effort. Practice the technique once or twice daily, but not within two hours after any meal, since the digestive process seem to interfere with the elicitation of Relaxation Response. 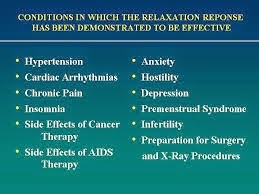 The feelings accompanying the Relaxation Response vary among individuals. The majority feel calm and relaxed. A small percentage of people immediately become ecstatic. Others describe feeling of pleasure, refreshment, well being. A word of caution – Many Meditation Organizations teaches that if a little meditation is good, a lot more is even better. Our observation, how ever is that, many people who meditate several hours every day for weeks at a time tend to HALLUCINATE. But we have not noted any harmful side effects in people who bring fourth the Relaxation Response once or twice daily for 10 to 20 minutes. A second word – The benefits of meditation will last only as long as you regularly bring fourth the Response. “Taxpayers should make reasonable efforts at the time the transfer pricing is established to determine whether the transfer pricing is appropriate for tax purposes in accordance with the arm’s length principle. Tax administrations should have the right to obtain the documentation prepared or referred to in this process as means of verifying compliance with the arm’s length principle. However, the extensiveness of this process should be determined in accordance with the same prudent business management principles that would govern the process of evaluating the business decision of a similar level of complexity and importance. Moreover, the need for the documents should be balanced by the costs and the administrative burdens, particularly where this process suggests the creation of documents that would not other wise be prepared or referred to in the absence of tax considerations. Documentation requirements should not impose on tax payers’ costs and burdens disproportionate to the circumstances, taxpayer should nonetheless recognize that adequate record keeping practices and production of documents facilitates examination and resolution of transfer pricing issues that arise”. Examples are given of each point covered under the section 92A which is not given under the Income tax act, 1961. Tangible property has an existence in physical form. Any property other than tangible is intangible property. OECD guidelines include right to use industrial assets such as patents, trademarks, names, designs or models as intangible properties. It also includes literary and artistic property. OECD guidelines focus on “business rights” associated with commercial activities including marketing activities. a. The threshold limit for SDT can be computed either on net basis (i.e. without including indirect tax levies like service tax, VAT, etc.) If the assessee is availing credit of those indirect taxes or on gross basis if the assessee is not availing credit, depending upon the method of accounting regularly followed. An useful reference may be made to the paragraph relating to Sales, Turnover, Gross Receipts under Guidance Note on Tax Audit u/s. 44AB issued by the Institute for the purpose of determining the threshold limit. c. The persons/entities receiving such income will not be subject to SDT under this provision and would not be required to comply with the relevant transfer pricing compliances. d. These provisions are applicable to expenditures claimed as deduction under ‘income from other sources’ head on account of specific direction in section 58(2) which states that provisions of section 40A are also applicable for computation of taxable income under “income from other sources”. g. Relationship chart is given to explain the persons who are covered under section 40A. Specified domestic transactions as defined in section 92BA also refer to any transaction, referred to in any other section under Chapter VI-A or section 10AA, to which provisions of section 80-IA(8) and section 80-IA(10) are applicable. b. The factors given under Rule 10C are to be applied cumulatively in selecting the most appropriate method. The reference therein to the terms ‘best suited’ and ‘most reliable measure’ indicates that the most appropriate method will have to be selected after a meticulous appraisal of the facts and circumstances of the international transaction or specified domestic transaction. Further, the selection of the most appropriate method shall be for each particular international transaction or specified domestic transaction. The term ‘transaction’ itself is defined in rule 10A (d) to include a number of closely linked transactions. Therefore, though the reference is to apply the most appropriate method to each particular transaction, keeping in view, the definition of the term ‘transaction’, the most appropriate method may be chosen for a group of closely linked transactions. Two or more transactions can be said to be linked when these transactions emanate from a common source being an order or a contract or an agreement or an arrangement and the nature, characteristics and terms of these transactions are substantially flowing from the said common source. For example, a master purchase order is issued stating the various terms and conditions and subsequently, individuals orders are released for specific quantities. The various purchase transactions are closely linked transactions. c. Examples are given where variation of 3% in TP is explained. a. Development of market including advertisement and product promotion etc. d. Fluctuations in demand and prices. j. It is important to note that the transactions entered into by associated enterprises with unrelated party (“internal comparables”) would provide more reliable and accurate data as compared to transactions by and between third parties (“external comparables”). OECD’s Guidelines on Transfer Pricing recognize the fact that external comparables are difficult to obtain and, also, it may be incomplete and difficult to interpret. Hence for these reasons, internal comparables are preferred to external comparables. Only differences that would materially affect the price in the open market are required to be adjusted. Two points may be noted. Firstly, materiality would have to be judged in the light of various circumstances. If there are numerous adjustments, which are individually not material but collectively material, the necessary adjustments are required to be made. Secondly, the term ‘open market’, though not defined, would mean a transaction between a knowledgeable and a willing purchaser and a knowledgeable and willing seller where neither of them is influenced or compelled to act in a particular manner. Explanation to the section 80IA not defined the term open market. An Appropriate resale price Margin is easiest to determine where the reseller does not add substantially to the value of the product. It may be more difficult to use the RSM to arrive at an arm’s length price where before re-sale the goods are further processed or incorporated in more complicated product so that their identity is lost or transformed. Rule 10B(1) profit split method, which may be applicable mainly in international transactions involving transfer of unique intangibles or in multiple international transactions which are so inter- related that they cannot be evaluated separately for the purpose of determining the arm’s length price of any one transaction, by which……. g. Other Method is used in case of International Transactions. It is applied when a property purchased or services obtained from associated enterprises are resold to unrelated parties. Universally applied but used as a method of last resort, where RPM cannot be used. New method according to Situation but the applicability according to our understanding in case of Director’s remuneration, cost allocations , allocations between group entities, Intangibles etc. (j) Trends in profitability, turnover, market share etc. b. A similar description of the business of the associated enterprises with whom the assessee has undertaken international transactions, is also to be prepared by the assessee. The accountant shall verify if such description is also maintained. e. Ownership interest held by enterprises in the assessee enterprise, directly or indirectly through intermediaries, also needs to be maintained by the assessee. f. Summarized global financials and other details such as capital invested, assets employed, turnovers achieved, incomes earned, profits made / losses incurred, etc. g. Sometimes, the establishment of ownership linkages between the assessee and other associated enterprises is a problem for the reason that sufficient reportable information is not available. In such cases, the assessee will have to provide only the information that is available with him. i. The assessee is not required to maintain this information in respect of other associated enterprises i.e. enterprises that are not its group entities but are deemed to be associated enterprises by virtue of provisions of clauses (c) to (m) of section 92A(2). Defined & described but progress still not full achieved.